Control Resources’ custom electronic design and manufacturing group has provided DC motor speed control solutions for several OEM customers. Our motor control consulting engineers have designed brushless and permanent magnet DC motor speed controls used in refrigerant pump, liquid dispensing and gear motor applications. All of these designs rely on our Microchip design consultant engineers to develop a robust, full featured DC motor speed control. CRI’s ISO 9001:2008 registered custom electronic design and manufacturing facilities have provided motor control consulting and Microchip design consulant services to OEM’s worlwide. 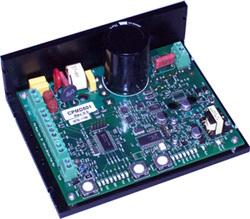 This DC motor speed control can output up to 5 amps. Our motor control consulting engineers designed a 3-phase, 6-step sensorless back EMF commutation DC motor speed control. Our Microchip design consultant engineers incorporated innovative motor control firmware resulting in an efficient, cost effective solution. Our motor control consulting engineers created this custom analog design that includes an exceptionally low 1.01 form factor that minimizes heat buildup and delivers continuous, steady output power. Our Microchip design consultant engineers provided a unique digital interface allowing for specific and repeatable control parameters. Contact our motor control consulting group today.